Happy Christmas Eve and I'm just barely started! I was a big slug yesterday and laid around most of the day watching Stephen King's The Stand, okay well I've read the book so I watched and napped while Gene watched--all four parts in one afternoon! Felt good to slug out especially since my knees have been killing me. Whine whine. But today I will bake in earnest and post all weeks about the things I've learned and succeeded and failed at. Hee hee. I did have great luck with a new cranberry bread recipe from "The New Best Recipe" cookbook from Cook's Illustrated. We had a smaller party of just my brothers and sister and their kids on Saturday night and that was a huge hit with requests for more for the big family Christmas evening party. I think it's the combination of the orange zest with the cranberries that really swings that recipe into something special. Personal note: This bread IS SO GOOD I bought three extra bags of cranberries to freeze so I could make it at other times of the year! 1. Adjust an oven rack to the middle position and pre-heat to 375 degrees F. Grease the bottom and sides of a 9x5 loaf pan and dust with flour, tapping out excess. 2. Spread pecans on a baking sheet and toast until fragrant, 5-7 minutes. Set aside. 3. Sitr together the orange zest, orange juice, buttermilk or sour cream, butter, and egg in a small bowl. Whisk together the flour, sugar, salt, baking powder, and baking soda in a large bowl. stir the liquid ingredients into the dry ingredie3nts with a rubber spatula until just moistened. Gently stir in the cranberries and pecans. Do not overmix. Scrape the batter into the prepared pan and smooth the surface with a rubber spatula. 4. Bake 20 minutes then reduce the heat to 350 degrees. Continue to bake until the loaf is golden brown and ta toothpick inserted int he center ocmes out clean, about 435 minutes longer. Cool in the pan 10 minuutes, then transfer to a wire rack and cool at least 21 hour before cutting. Can be stored out on the cabinet for up to 3 days. 1. Pre-heat oven to 350 degrees. Cream butter, almond paste, cream cheese, sugar, and egg until light and fluffy. Mix in extracts. 2. Mix in flour until just mixed. 3. Scoop into cookie press with press wheel of choice and press onto ungreased cookie sheets using 1 full turn per cookie. 4. Bake for approximately 15 minutes or until cookies are lightly golden at the edges and ridges. Dough can be colored using paste food coloring if desired. 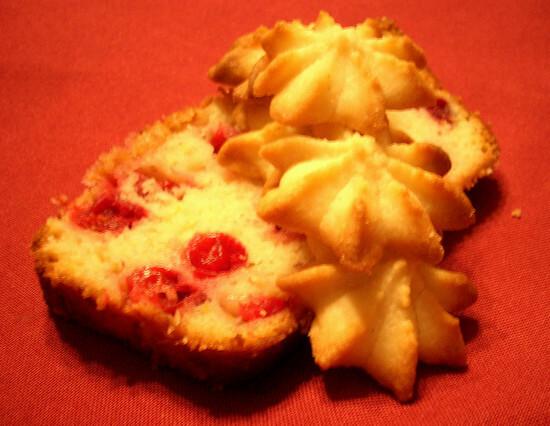 I used to make those cream cheese spritz cookies--every Christmas, when I was living at home. Somewhere, I have my old spritz maker (the manual kindd), but have no idea exactly where it is. Have a wonderful Christmas! And you know the old saw - You're only as old as you think...Think young! I've been avoiding the glasses thing myself... don't know how much longer I can hold out, though. Sher--I had trouble finding mine too! Margot--Same to you and your family! Katie--There you go. You're right. Only as old as we feel, I mean, think.